Prepare for fantasy battles beyond your wildest imagination with the onslaught of BattleLore Second Edition. 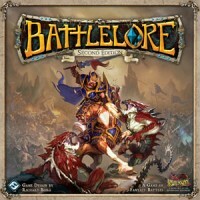 Set in the fantasy realm of Terrinoth, BattleLore Second Edition is a two-player board game focused on squad-based battles between the hardy defenses of the Daqan Lords garrison in Nordgard Castle and the unleashed ferocity of the demon-worshipping Uthuk Y’llan. You must strategically command your troops and use the power of lore to tip your battles in your favor. I was skeptical at first about how the new edition of this game would turn out as I enjoyed the first edition from Days of Wonder. FFG bought it then did Battle of Westeros with it and it was in a different direction. This ended up being quite a surprise to me, it still uses the basis of command and colors for it. There are two factions right now, tons of plastic miniatures. Each side has 7 scenario cards that will tell you have to set up half of the board. Together they will make up the whole battlefield. They will have some special rules for it as well. There is a lot of differences from the first edition to the second edition. There is a double blind simultaneous set-up which involves cards. The rules are about average to pick up. Really hope there will be expansions. Will most likely get them since its a FFG release. -Factions have their own decks with their own abilities unlike 1st edition. -Game length is quick to average. So 30 min to an hour and a half in my experience. -the best in the Command and Colors family. 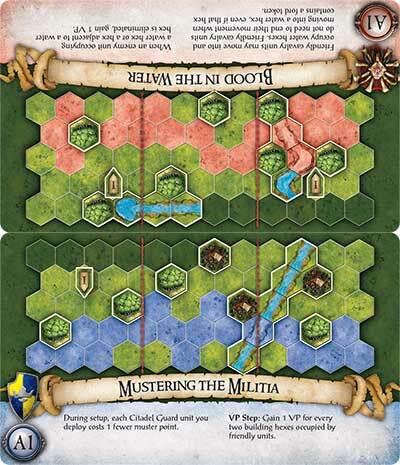 -For the gamers who do a lot of miniature war gaming and the such, may be a bit too elementary/basic for them. This is a great refinement of Richard Borg’s system. I especially enjoy the balance between strategy and uncertainty. Although not having the right cards for troop movement can sometimes get frustrating, there is enough options in the game for changing the tide of battle even when you are behind. The initial setup, where troop deployment cards are placed face-down together with a number of decoy cards, also adds a lot to the replayability of the game. Unfortunately, Fantasy Flight stopped supporting this game about a year after its release, but I am confident that the expansions that they published after initial release are more than enough to keep the game interesting. You can still get them from some online sellers. Although I never played the original, this game is just so much fun. The replay ability is amazing due to all the scenarios and different cards you get each game. It is never the same. The pieces are beautiful and although there is luck involved in dice rolls there is more then enough strategy in the placement of your units to give yourself the best odds for a win. I have played this game a bunch of times and every time I play I feel like I realize something new. Some sort of new strategy that did not click or even sometimes I was reading a card wrong and didn’t realize how great it actually was. The game is by far one of the funnest strategy, war games I have played and I recommend it to anyone. Also, if you don’t have anyone to play Battlelore with in person, but want to play something similar online, checkout BoneLands. Very similar play style. 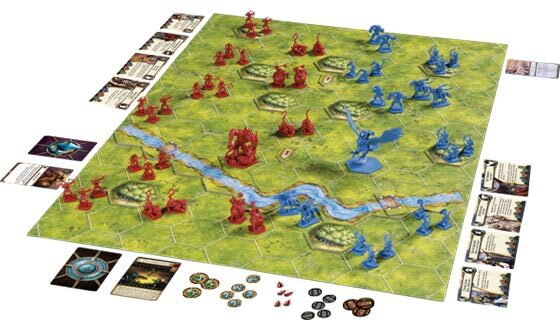 Add a Review for "BattleLore Second Edition"
A game board, ninety-two detailed figures, forty-three map overlay pieces, more than one-hundred fifty cards, rules, four custom dice, and everything else you need to win the borderlands of Terrinoth!